Just a quick post. 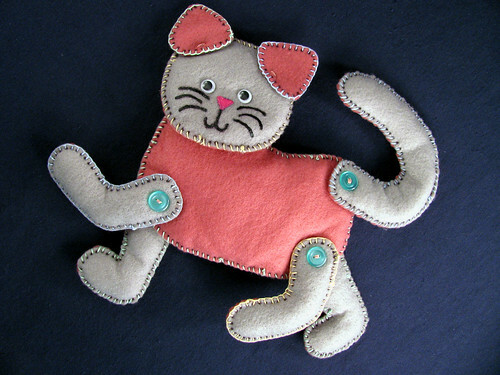 Here is a photo of one of the projects I used to teach 2nd graders how to hand sew. The pattern is in the book “Sewing Machine Fun!” and I used the sewing method described in “My First Sewing Book”. I cut out the shapes in washable felt and dotted where to stitch. The students then stitched and stuffed the shapes using a chenille needle and size 30 crochet thread. They learned to sew on both kinds of buttons, because the googly eyes have a shank. The nose and whiskers are done in puff paint. The girls really liked this project. After we finished these we went on to make dolls and then they all embroidered a pillow. After that, I did a class on beginning knitting where they knit purses. The girls that were really quick went onto a hat and then one even started knitting a doll. At that age they are so hard to keep up with. This entry was posted on Tuesday, March 3rd, 2009 at 2:43 pm and is filed under Craft. Tagged: Craft. You can feed this entry. You can leave a response, or trackback from your own site. What a cute project for a young beginning sewer! I’m sure the kids loved it! What a darling project! I’m sure that gave the kids such an amazing sense of accomplishment when they were done with it! What a wonderful lifelong hobby you may have help light a fire for in some of those kids! ((Hugs)) to you!